(Saul Loeb/AFP/Getty Images) Representative Ilhan Omar, Democrat of Minnesota, speaks during a press conference calling on Congress to cut funding for US Immigration and Customs Enforcement (ICE) and to defund border detention facilities, outside the US Capitol, Feb. 7, 2019. 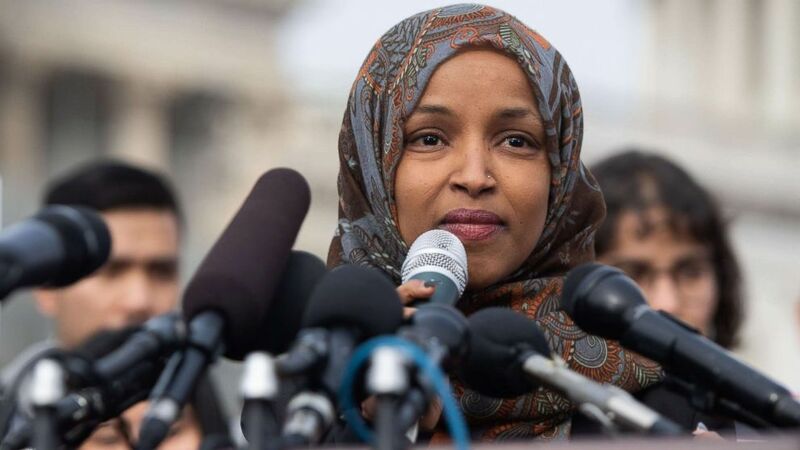 The back-and-forth coincided with Trump’s planned visit to the state Monday to talk about taxes in a district that neighbors Omar’s own. The congresswoman commented on the president’s visit on Twitter after he announced he was en route. “The Great State of Minnesota, where we don’t only welcome immigrants, we send them to Washington,” she said. Omar is a Somali-American refugee. A crowd of protesters from CAIR, an advocacy group for Muslim-American civil rights, awaited the president’s arrival at the company’s base. Minnesota is home to a large number of Somali immigrants, many of them Muslim. Nearly one in three Somali-Americans live in the state, according to the U.S. Census Bureau, and between 42,400 and 55,200 people — about 1 percent of the population of the state — is of Somali heritage, according to recent census data. The Minneapolis metro-area, in particular, is home to a number of these immigrants and their families. Trump’s visit will also garner attention from other groups who will be affected by recent policies, either floated or enacted, by his administration in recent days –particularly those who support efforts in the Twin Cities to align with sanctuary city policies and those who oppose his administration’s policy to limit transgender members’ service in the military.